MANY PEOPLE ENJOY birding activities during the fall migration period in Utah. Songbirds, hawks, waterbirds and waterfowl travel through the state, especially the areas near the Great Salt Lake and its wetlands. Whether you drop everything to find a rare bird that’s been sighted, wake up early to sit in a duck blind or simply enjoy watching your birdfeeder from the warmth of your breakfast table, fall migration can be a magical time. When fall migrants head south, they often fly in huge flocks. However, these migrations usually occur at night. Birds migrate at night because it decreases their risk of predation and typically provides them with calmer winds. But for birders, nocturnal migrations mean that we don’t get to enjoy the spectacle of thousands of birds taking wing at once. While we might not be able to see migrations firsthand, we can still observe them using a tool that might surprise you: weather radar. Weather radar stations were designed to track storms, but they also pick up any other objects that move through the air. The weather images you see on the news have been edited to remove non-weather objects such as migrating birds. But when you view the raw data, you can see these amazing migrations take place. Millions of birds rely on the Great Salt Lake ecosystem to provide food and shelter before they migrate. One of these species is the eared grebe. The Great Salt Lake is especially important for eared grebes because over half of all the eared grebes in North America use the lake each fall. The rest of the population uses Mono Lake in California. The total continental population of eared grebes is 4 to 8 million birds, but their reliance on just two areas during the fall makes them a management priority for wildlife scientists at the Great Salt Lake. A closeup of an eared grebe. Eared grebes begin to migrate south later than most other species at the Great Salt Lake. Eared grebes usually begin to depart in late November or early December, although they may leave as early as mid-November and as late as early January. Rather than all leaving the lake at once, eared grebes depart from the lake on multiple nights over the span of several weeks. You can watch eared grebe migrations on radar! The National Oceanic and Atmospheric Administration maintains a network of high-powered weather radar stations across the U.S. The station for Salt Lake City, KMTX, is located on Promontory Point. Due to the elevation of the radar station, you can’t see the migrating grebes when they first take off because the lower range of the radar scan is above the level of the lake. As grebes climb to a higher altitude, however, the flocks appear on the radar images. Remember, the radar picks up any objects moving through the air — in addition to flocks of grebes, the radar detects precipitation, blowing dust and other species of migrating birds. So you have to look carefully to figure out if you’re seeing a grebe departure. Radar scans collect different types of information. Most researchers use base reflectivity data to look at bird migrations. Base reflectivity essentially measures the density of the objects in the scan. When you watch a weather forecast, you typically see base reflectivity images, which show the intensity of the precipitation. Watching eared grebes migrate from Great Salt Lake is actually easier using base velocity data. Base velocity images show the speed of an object relative to the radar station. Warm colors (yellows, oranges, and reds) on a base velocity image indicate that an object is moving away from the radar station, while cool colors (greens, blues) indicate that an object is moving toward the station. Gray indicates objects moving perpendicular to the radar scan. Figure 1. A “typical” eared grebe migration. You can see the column of warm colors south of the radar station, which is the white dot marked “KMTX.” Sometimes eared grebes will fly west of the Stansbury Mountains, as seen in the small column. The large column is a flock flying between the Stansbury and Oquirrh ranges. When eared grebes fly south, they appear on the radar as a block of warm colors south of Great Salt Lake (see Figure 1). Eared grebes fly between the Stansbury and Oquirrh mountains or west of the Stansbury range. Timing is important. Eared grebes begin their migration after sunset, so you’ll want to look at images from about 5–11:00 p.m. local time. Figure 2. This image is tricky. There is a warm-colored column south of KMTX, but notice that its tail that extends to the northeast. If you’re not sure about an image, it may help to view it on an aerial imagery background. On the right image, you can see that the flock originated from Farmington Bay (purple arrow showing route). Eared grebes do not use Farmington Bay before migration, so this flock is probably ducks or other waterfowl. Location is important. Eared grebes mainly stage in Carrington and Gilbert bays, so the flock should originate from one of these areas. The radar station is scanning the area above the lake and cannot “see” birds until they are up higher in the air. 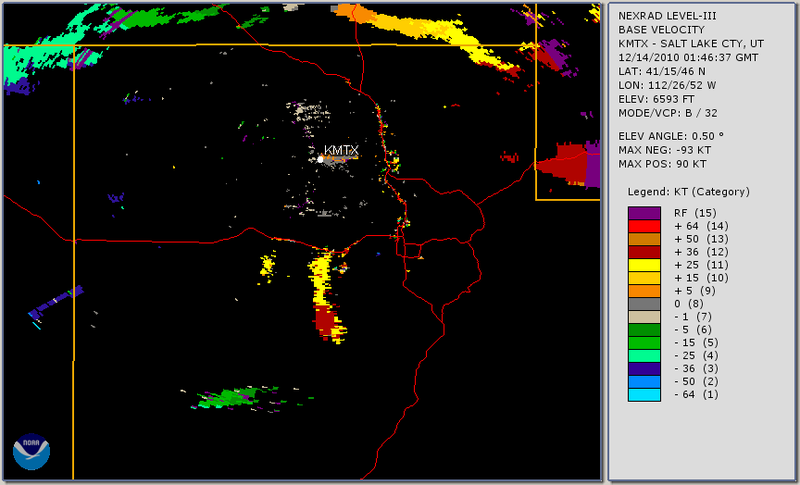 A flock that originates from Farmington Bay will appear on the radar just west of Antelope Island (see Figure 2). These flocks are waterfowl, not grebes. Figure 3. This image shows a column but also lots of scatter. The dense, red column is a flock of migrating grebes. The yellow and orange scatter to the east and southest of KMTX may be precipitation or another species of migrating birds. Pattern is important. Eared grebe flocks appear as a fairly tight block of color. Other migrating birds and precipitation appear more scattered. Some images are tricky — you may see eared grebes leaving on the same night as other birds or when there is also precipitation (see Figure 3). Ready to watch the migration? There are two different websites you can use. The first is at radar.weather.gov. This site is good for easily viewing current images. On the left-hand side of the screen, select “Base” under the Velocity heading. You can also choose “Loop” if you want to see all the images from the previous hour. Note that these images use shades of red and green instead of the multicolored images you see in the images in this blog post. This is simply because of different resolution of the radar data, and the same rule applies: warm colors (reds) represent objects moving away from the radar station. What if you don’t want to stay up late watching the radar? You can get images from the past five days at weather.rap.edu. For Product, select 0.5° Velocity. For Background, any choice will work but a black background provides the best contrast. Note that the date and time are in UTC. 0100 UTC corresponds to 1800 MST the previous day. If you want to look at the most recent radar image, you can simply choose “Most recent” for the end time. But if it is morning and you want to check images from the night before, choose “Today” for the end date. For the end time, choose 0600 UTC and set loop duration at 5 hours. 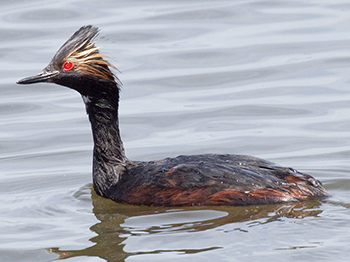 This will allow you to see all the images from the time period when grebes would have been departing the night before. Finally, click “MTX” on the map to load the images from the Salt Lake City station. Remember, eared grebes depart on multiple nights over the span of several weeks, so check each night to see whether any grebes headed south. We hope you enjoy watching the great migrations of eared grebes from the Great Salt Lake. 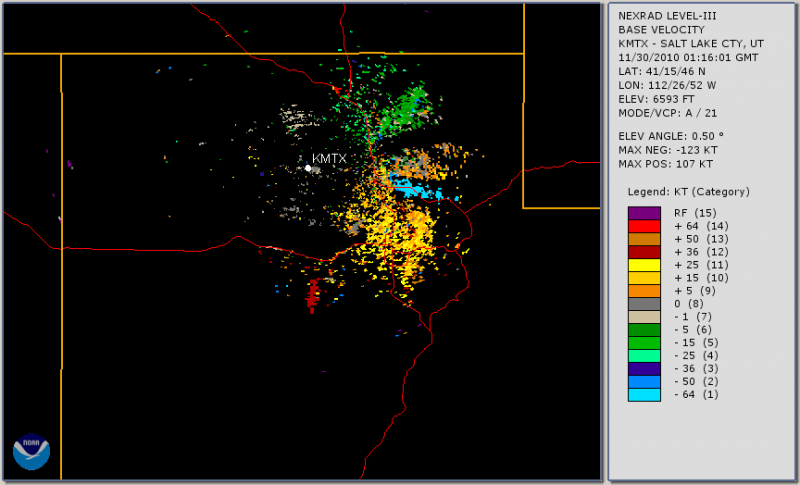 If you want to learn more about radar and radar ornithology, check out Northern Rocky Mountain Science Center, Fort Collins Science Center, Radar Ornithology Laboratory at Clemson University and University of Delaware Aeroecology Lab. The eared grebe departures have begun. Check out the last three nights (December 1st, 2nd, and “Today” under the “End Date” options at weather.rap.edu). Follow the instructions above and you’ll see a large departure on December 1st beginning at 1:00 UTC and a small departure at 3:13 UTC on December 2nd. For “Today” you’ll see two departures, one beginning at 1:30 UTC and the second at 3:18 UTC. Keep looking over the next two weeks or so to see more grebes on radar as they leave Great Salt Lake for the winter.